A WebmasterWorld thread is reporting either a somewhat widespread glitch in Google Webmaster Tools or some sites that are having issues. I am personally able to validate the issues, so let me show them to you. So, they all show different URLs, i.e. /archives/000161.html‎, ‎/archives/001078.html‎ and ‎/archives/013900.html‎, but when you click on any of them, they all go to the /archives/000161.html‎ version. So, I took a peak behind the HTML in webmaster tools to see, yes, Google is indeed linking every page to the first URL. But why? Is this a bug or does Google really take the liberty to redirect them as duplicate pages to the first page? No! Notice, the /archives/000161.html‎ version isn't even listed in this version. 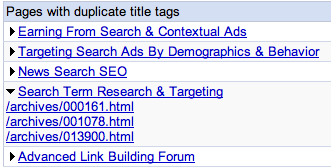 If I expand the results, to show all results from the Search Engine Roundtable, then it will show a total of four results (not three) and it will include the /archives/000161.html‎ result. So, it seems like a reporting issue in Google Webmaster Tools and I would not worry that your site has major issues.